The Saint lived as an ascetic on Mount Athos for five years in the Cell of Saint Basil in the desolate area known as Kapsala. Throughout this time he survived only on boiled zucchini with no oil. It was here that he gained many spiritual experiences and received the monastic tonsure. The demons had no power over him, but rather he acquired the power to cast them out. His nickname became "Kapsalis" ("the burning one"), after the desolate place of Kapsala. The demons would cry out: "Kapsalis, you have burned us." He acquired such power over the demons that later when he travelled to the Holy Land he desired to imitate the forty day fast of the Lord in the same wilderness that He faced the trials of the devil. For forty days he ate nothing in the wilderness and gave the devil his final blow. He would later go to Kefallonia and establish the Monastery which today bears his name and has become a refuge for those battling with and possessed by demons. 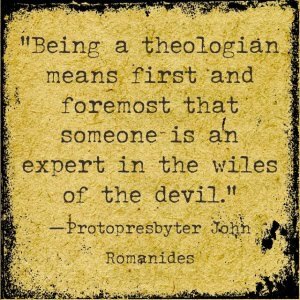 "The insane are the Saint's expertise" according to Father John Mesoloras, "which is why there are special quarters for them to do their 'forties' (40 days of fasting and prayer) in order to be absolved of the demons that had conquered them." The possessed and the mentally challenged are all called to imitate St. Gerasimos as much as possible during these forty days to receive their freedom from demonic power and find favor with the Lord to bestow His mercy and grace upon them. On the two major feasts of St. Gerasimos (August 16 and October 20) there is a procession with his incorrupt relics, during which time many of these seek to secure a position to lay down anywhere along the procession's path so that the Saint may pass over them - some cooperate, others resist and require help from family or even the police if they get unruly. 1. 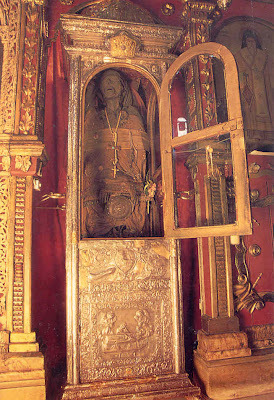 A few years after the death of the Saint, a nun in the monastery where he was enshrined became possessed and during the night had fallen into the well. The other nuns heard the voice of Saint Gerasimos telling them, "Go quickly, the possessed one is in danger and needs your help." They all went forth with torches and found their sister in the well, not sinking, but floating on the surface of the water as if someone was holding her up. She called to them, "Throw me a rope reverend mothers, so that I may be saved." When she was lifted out of the well, she was cleansed of her possession. Together, the sisters went into the shrine and thanked God and Saint Gerasimos for the miracle. 2. In 1923, two girls (ten year old Elaine Stephanatou, from the village Kalavathi, and twelve year old Elpiniki Vaslatou, from the village Razaton) became possessed. They were brought to the Monastery by their parents hoping that their children would be cured. All the nuns pitied them and helped pray for the children. On August 16, 1923, during the Liturgy, both girls were cured. 3. Once, there was a monk from the Monastery of Saint Paul on Mount Athos who had gone to the Church of Saint Gerasimos on the island of Kefallonia. During the Divine Liturgy, he stood in the Altar and was praying with his komboskini the Prayer of the Heart - "Lord Jesus Christ, Son of God, have mercy upon us" - while outside they were chanting. They had also brought a possessed person into the church to be cured by Saint Gerasimos. While the monk was saying the Prayer in the altar with his komboskini [prayer rope], the demon was being seared outside and was shouting: "Stop working that string, will you, Monk; it is burning me." The priest heard it, too, and said to the monk: "Pray with our komboskini as much as you can, my brother, so that God's creature can be freed of the demon." The demon then shouted in great anger: "You, rotten Priest, you. What are you telling him to pull that string for? It is burning me!" The monk then prayed with his komboskini with even greater effort and the possessed man was delivered from the demon. 4. This is from an eye-witness: "A woman had a demon and the demons tremble at only hearing the name of the Saint [Gerasimos]. The woman remained at the Monastery for a period of time, given hospitality by the nuns and at a Divine Liturgy the demon could not bear it, and later she herself recounted that she felt something with power leave her body. I must say that a few days before I arrived and when the priest was performing the Holy Unction, and when the time came for the priest to anoint this woman with the demon, she got up and said a phrase that I remembered characteristically, 'Is it not enough that the old priest that stays here doesn’t leave me in peace day or night, and today you with the oil, the two of you will burn me?' and as soon as she was anointed, the demon was so shaken that the woman fell down unconscious and after a few days by the grace of the Saint she was freed." 5. One young man relates how he happened to be traveling in Kefallonia during the feast of St. Gerasimos. When he arrived at the Monastery he says that loud screams were coming from the demon possessed in the church, saying: "You are burning me, Gerasimos. You are burning me, Kapsali." Everyone understood in the church that there was a spiritual battle going on around them at that moment that they could hear but not see. "Hey John, you left your fiance in Kambera and have now come to Kapsali...and you had that other married woman...why? What have you found better here? And on the way your airplane almost fell over Singapore...that was me who would have dropped the plane, but the Nazarene and Gerasimos would not let me, so you were saved...."
She then began to say names of people unknown to her that lived thousands of miles away that he knew, and would talk about instances of doing things to them but prevented from going further by "the Nazarene and Gerasimos". The priest then told some in the crowd: "The things you heard are nothing compared to what really happens. This girl was brought here from Xanthi. With some fellow students she had gone to two men named Christos and Gazoro to be told about their future. After this she became possessed and now her family takes her from one monastery to another. For hours on end she tells people the secrets of their lives as she told the young man in the jacket. You must beware however. The Holy Fathers say to not put our trust in the demon possessed. Sometimes they say secrets, but only as much as Christ allows them to say, and other times they say lies. If they tell you five truths and see you believe them, the sixth time they will lie to get you to enter into a dispute with a neighbor. Only those who have gone to Confession are prevented from being called out by the demon possessed...they are blocked. They reveal the sins of the unconfessed, even from among the priests." A 17 year old boy from last May has been troubled by an unclean spirit. He attends High School in Lefkada and is from the village of Vathy. In the last days of September, during the time in the Liturgy when Fr. 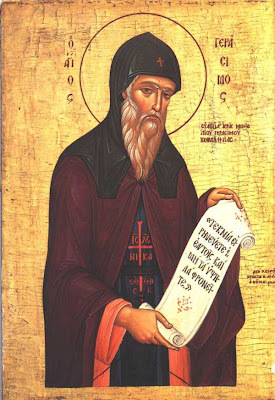 Spyridon Linardatos was chanting in the Monastery, the young boy was in the church and suddenly began to scream in a frightened manner: "Gerasimos, you burned me, where will you drop me? What will your Lord do? Where will he put me? I am Legion who the Lord ordered to go into the wild swine." During this time the priest was trying to exorcize the unclean spirits with the HonorableCross. The unfortunate young man was continuously biting on the Honorable Cross saying that it was a great weapon that cuts like a knife. The following day during the Divine Liturgy the young man fell before the coffin which holds the relics of the Saint screaming: "Gerasimos, you have silenced me. I am the demon of demons. You silenced me, you beat me up. Open the window that I may leave." After a little while the young boy got up and was healthy. This young boy eventually grew up to become a priest and always prayed to St. Gerasimos. O believers, let us praise the protector of the Orthodox, the God-bearing miracle-worker lately appearing to us, the incarnate angel, divine Gerasimos. For he has rightly received from God the ever-flowing grace of performing healing. He strengthens those with diseases and he heals those with demons. And therefore he pours out healings to those who honor him.